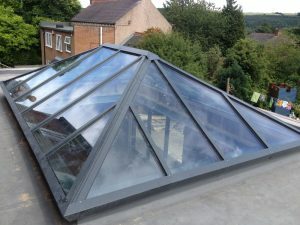 Rooflight Architectural have many years experience supplying all types of Rooflights and roof glazing to the commercial sector, and more recently have successfully installed many Lantern Lights, Walk On Rooflights and Pitched Roof Glazing projects to domestic properties throughout the UK. With rooflights comprising narrow structural Aluminium framework, Powder Coated to any BS or RAL colour, and the latest high specification glass including Solar Control and Self Cleaning options, they are the perfect choice for any new build or re-furbishment. Full advice and Design assistance is given, drawings prepared if required, and a reliable nationwide installation service offered. With offices in London, the Midlands and the North East, local assistance is always available.